For the author to whom the Book of Obadiah is attributed, see Obadiah. The Book of Obadiah is an oracle concerning the divine judgment of Edom and the restoration of Israel. The text consists of a single chapter, divided into 21 verses, making it the shortest book in the Hebrew Bible. In Judaism and Christianity, its authorship is attributed to a prophet who lived in the Assyrian Period and named himself in the first verse, Obadiah. His name means “servant of Yahweh”. In Christianity, the Book of Obadiah is classified as a minor prophet of the Old Testament, due to its short length. 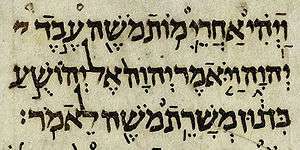 In Judaism, Obadiah is considered a “later prophet” and this Masoretic Text is chronologically placed in the Tanakh under the section Nevi'im in the last category called The Twelve Prophets. The western half of ancient Edom is the Negev desert all the way to Eilat, all part of modern Israel. The eastern half is possessed by the Hashemite kingdom of Jordan. In the days of Obadiah, the Edomites lived along the cliffs and mountaintops of the arid land south of the Dead Sea, all the way to the Gulf of Aqaba on the Red Sea. There was very little in the way of arable land, so the Edomites made their living supporting (and controlling) the main caravan route between Egypt and Babylon that passed through their whole land. Obadiah said in judgement God would wipe out the house of Esau forever, and not even a remnant would remain. The Edomites' land would be possessed by Egypt and they would cease to exist as a people. But the Day of the Lord was at hand for all nations, and someday the children of Israel would return from their exile and possess the land of Edom. The later date would place Obadiah as a contemporary of the prophet Jeremiah, both of whom were prophets in the respective time periods. The later period appears to be the scholarly consensus as Obadiah 1–9 parallels Jeremiah 49:7–22. The passage in Jeremiah dates from the fourth year of the reign of Jehoiakim (604 BC), and therefore Obadiah 11–14 seems to refer to the destruction of Jerusalem by Nebuchadrezzar II (586 BC). It is more likely that Obadiah and Jeremiah together were drawing on a common source presently unknown to us than Jeremiah drawing on previous writings of Obadiah as his source. There is also much material found in Obadiah 10–21 which Jeremiah does not quote, and which, had he had it laid out before him, would have suited his purpose admirably. Despite everything, however, there are some who support both dates and even some who support dates other than the two major possibilities presented. Any date for the composition of Obadiah must be held tentatively. In verse eighteen, it says that once judgment has been carried out, “There will be no survivors from the house of Esau” (NIV). So, according to Obadiah there will not remain even a remnant after Edom’s judgment; This is in contrast to Amos 9:12, where Amos refers to such a remnant, however, it is stated that their possession will be given to Israel. Some scholars have suggested that Amos’s reference to Edom is symbolic of all nations who were once enemies of Israel and not meant to literally mean Edomites in the flesh. This is certainly the perspective of Luke as he recites the passage from Amos in Acts 15:17. Edom is symbolic of the remnant of men and Gentiles who will eventually bear God’s name. Moreover, Frederick A. Tatford in Prophet of Edom’s Doom says that Obadiah’s prophecy is fulfilled today as there is currently no trace of anyone who may be identified as a fleshly Edomite. The identity of the land of Sepharad, mentioned only here in this verse in the Bible, Obadiah 1:20, is currently unknown. It is also unknown whether or not Sepharad is a city, district or territory. The only clues for its possible existence are Persian inscriptions that refer to two places called "Saparda": one area in Media and another in Asia Minor, debated to be Sardis. For other parallels, compare Obadiah 1:1–8 with Jeremiah 49:7–16. The overwhelming theme found in Obadiah is the destruction of the enemies of God’s people. Unlike other prophets who call the hearers to repent before they fall under judgment, Obadiah's message is one of inevitable doom as a consequence of previous actions. A Christian with a knowledge of the New Testament of the Bible would say that although God’s grace and forgiveness abound in such situations, because God is just there are consequences for opposing God and God's people. Obadiah shows that judgment falls even within the family of God, as Israel and Edom descended from twin brothers, Jacob and Esau. His purpose was to make it known that according to his God, if members of the same family were to treat each other in the same manner as Edom treated the Israelites, they too may be subject to the wrath of God. In relating to theme of Obadiah, it is important to underscore the “punishment” theme this book outlines against Edom. W.J. Deane and J.R. Thomson write this valid conclusion, “The Book of Obadiah is occupied with one subject – the punishment of Edom for its cruel and unbrotherly love conduct towards Judah...” One can link this idea of punishment to one of the major prophets “Ezekiel” who “...interprets the exile to Babylon and the destruction of Jerusalem as deserved punishments for the sins of those who themselves committed them.” Verses 3–7 in Obadiah explain to the reader the reason for the punishment theme, “Confidence in one’s power, intelligence, allies, or the topographical features of one’s territory is often mentioned as an attribute of those who foolishly confront the Lord and are consequently punished.” Although destruction is vital to understanding Obadiah, it is of note to understand the destruction being a consequence of action. ↑ "oremus Bible Browser : Obadiah 1". Bible.oremus.org. 2011-02-10. Retrieved 2012-01-26. Obadiah, from John Gill's Exposition of the Entire Bible.